Good Morning!!! I have to recap what a GLORIOUS weekend and the WEATHER!!! It's been positively Balmy really. 10C here and many of us hearty Canadians are ready to cast our down coats aside for fleecy Hoodies!!!!! I just came back from a little walk with Syd and Mom and have to say I'm glad I wore my winter coast as it was just a touch chilly in the Breeze. Even so, just having the warm sun on one's face can do wonders with regard to lifting a wintery mood. A few years ago, I hosted the Inspiration Challenge on Splitcoaststampsers Things got a little complicated in my life and sadly, I took a step back from many of the things I loved, including hosting the Scrapbook Challenge. In the last two years, once again, my life has become manageable, having purged unhealthy relationships, commitments and alliances. I have once again found time for me and for doing the things that I love the most......relaxing walks (although my distance is limited) spending time with my friends and family and my creative expression. So as you see above, this is the first layout i've created in quite some time. I have a funny story to share about the Scrapbooking Papers. Last year I was at a crop and I purchased this packet from a lady who had a pop up shop there. We are so limited with regard to accessing Scrapbooking Supplies here in Kingston as we don't have a brick and mortar store here. Anyway, I purchased this Summer Paper Collection by Fabscraps. I am a sucker for anything Beachy or Nautical. The Kit held an assortment of delicious papers ( some of which you're peepers are gazing upon now) as well as a few Chipboard pieces and some stickers. In the layout above, I coloured the "AHOY" Chipboard piece with my Copic Markers so I could shade them. The Beautiful large lighthouse was on the patterned paper already and the colour combination perfect for this photo that we took of Jonathon on a visit to Confederation basin to board several tall ships. Was that really sixteen years ago? I spoonged the edges of the patterned papers with Tim Holtz Vintage Photo; my favourite ink for distressing! The stickers in the package were fairly sheer, so I adhered the red one on top of a White button to make the sentiment (summer) easier to read. It is a fairly uncomplicated layout, but I prefer my pages to be relatively clean. I treated the chipboard a little differently when creating this card. First I coloured it with a Black Sharpie. Once it was dry, I rubbed here and there with some metallic rubs. This gave the anchor a distressed look. I also added a touch of hemp to reinforce the nautical theme and mounted the stickers on Chipboard to give it a little dimension. I will be sharing more creations with this fun line however because I surely won't waste a lick of this super sweet designer paper. The weekend is quickly coming to an end. WOW! We had an amazing weekend weather wise. With the temperature creeping up to 10c it felt like Spring. Yesterday was a super day for a Road Trip. My Girlfriend Laura and I took a drive down to Belleville to meet Kim, who was down from London at her Brothers! Of course Ecstasy Crafts is along the way and we couldn't resist a little side trip there. I bought the cutest stamp and die set and will share with you in the near future. As you know, I really enjoy playing the Splitcoaststamper Challenges. I find they motivate me to create, share and spend time on the website looking at all the great creations. I just recently purchased the ZIG Clean Brush markers and I LOVE watercolouring with them. The colours are so rich. I only used One shade of coral, green and yesllow. Impressive! I Love the Happy Stamp set and Matching Die from Impression Obsession The Set allows you to stamp a Shadow and Layer the die cut over to give it a 3D effect! LOVE LOVE LOVE!!!!! 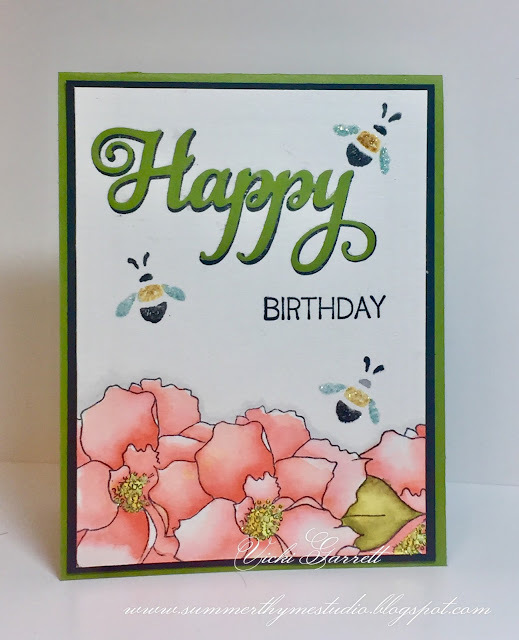 Lastly, I stamped the chalk bee using my Mini Misti. That allowed me to used markers to stamp the various sections. I finished up the card and added a little Vicki G Pizzazle with some gorgeous Cosmic Shimmer Diamond frost glitter! This is some of the most gorgeous glitter I've ever used!!! Good Morning! It's hard to believe that we're 7 weeks into 2017 already. My gosh, the time sure does fly doesn't it? I find even now that i'm home the days seems over before it has even began. A trip to the pool or the grocery store and a short walk or two with Sydney and a little stamping of course and it's bed time again! I added some dimension to the mitten by running it through my big shot with the SU! 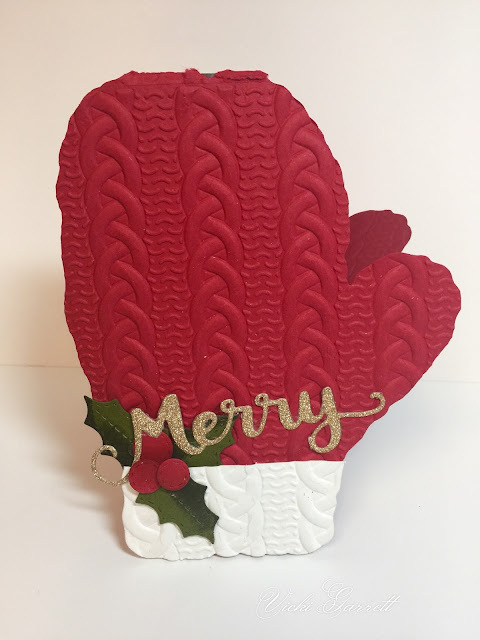 Cable Knit Sweater Embossing folder. Lastly, I added just the "Merry" portion of the Merry Christmas Die by carefully cutting the sentiment apart. I did it in Gold Glitter paper so as to add a little festive bling!!!! I'll save the "Christmas" word for another card perhaps!!! That's it for today! I hope you all have a wonderful weekend! Be sure to link your card up on the IO Blog to get a chance to win a $25.00 Gift Certificate to the IO store. First I coloured the image with my copic markers. I made a fun base under the eggs by using the tip of the marker to make a dotted pattern in different colours. I then cut the image out and layered it onto a pinky purply glitter background, layered onto a silver background. I mounted the image on foam dots to give it some additional dimension. Lastly, I stamped the sentiment from the Easter Basket clear set! I LOVE the quote by Coco Chanel. There is truly not a more beautiful feeling than being comfortable in your own skin. Making no excuses for beliefs or behaviour and appreciating the uniqueness in each and every one of us. Sometimes that isn't always easy to achieve, but I feel that when i'm striving toward that, I am more appreciative of the beauty that surrounds me both in my relationships and environment. Remaining mindful to be in the moment makes it a little easier. This card was exactly in compliance with the challenge, which was to make a card that showcases as sentiment. No extra stuff here, save for the glittery orb that dots the "i". Happy 77th Birthday to my Beautiful Mother. I feel so very blessed for your love. I feel proud to call you my best friend. Here's to many more Happy Birthdays! All supplies by Prima Marketing with the exception of the ❤ die, which is from Stampin' Up! I'm still working away at my Christmas Cards. Again, my focus is to create cards that I can send for standard postage. I don't want to give Canada Post one more cent than I need to. Don't get me started on the Canadian Postal system! Ah well, there could be worse things we as Canadians could have to endure! This card was fun to make. Rather than give you instructions, I'm going to do a video; erm, what I mean is I'm going to TRY to do a Video! I've been a little shy about trying this before, but I readily need to keep up with technology. Soooo stay tuned! I'll try not to keep you waiting long! Be back soon with a little more Eye Candy! Since i've been off since November, Ive been trying to maintain somewhat of a routine or structure to fill my days. Besides swimming and practing yoga and mindfulness I have been resting and relaxing! I signed up for two online courses to whet my creative appetite and hopefully grow in my art. I find it to be low pressure as the projects are posted Bi weekly for the entire year. This means that I should have little difficulty maintaining the pace, even when I do get back to work. Tell me, how to you fit your "creative time "into your busy schedule? 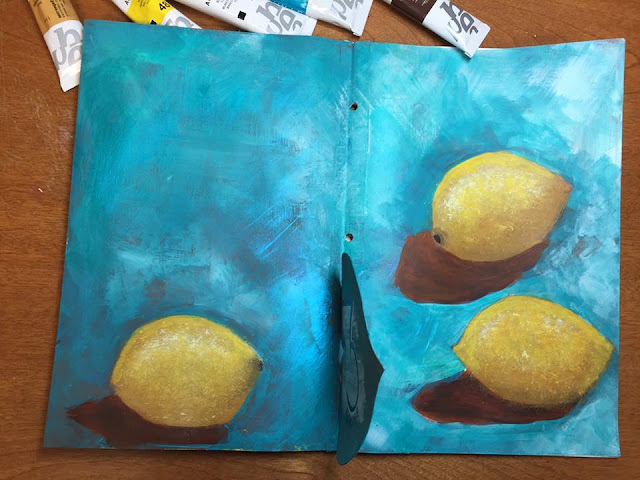 Our assignment for IW17 week three was to paint still life fruit. 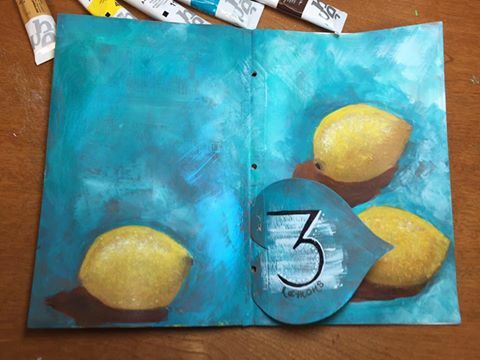 I followed the lead of Donna, choosing to paint Lemons....I was quite pleased with the way that they turned out and happy that they allowed me to create through a bout of insomnia last night. I haven't done much freestyle painting and can't WAIT to continue to experiment with Acrylic paint!!! Do you paint? If so, I would love you to add a link to one of your favourite creations in the comments section. I really enjoy other's art almost as much as creating my own. Are you all geared up for the weekend? I went out and got a few veggies as I'm doing a cleanse. I've been doing a lot of reading on Lyme disease and am trying some of the things that i'm reading to see if it will speed up my recovery or at least allow me to manage the symptoms. Goodbye Chocolate!!! I think it's quite pretty, albeit plain! Hope you're having a WONDERFUL week!!!!! It hasn't been long since you've been here last, if you were participating in the blog hop! 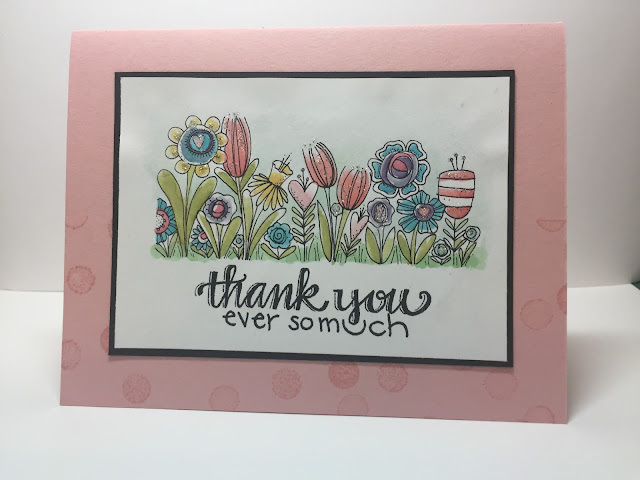 I watercoloured this adorable Jays Flowers Using Stampin' Write Markers and an Aquapainter. I have to apologize that it's a touch "wrinkly". It buckled a bit when I made a wash of the background. Not having done TOO much watercolouring, I will definitely tape my next watercolour project down while I'm doing it. I used the Confetti Dot Cover a Card. Isn't it FABULOUS??? also, be sure to check out the DT Creations!